Publisher: Fantasy Flight Games Language/Edition: English Condition: Used, in excellent shape. Publisher: Libellud Language/Edition: English Condition: Used, in excellent shape. Edition: CGE second edition Condition: Very good. A few pages used. Edition: Amigo 2018 ("Escape from the Hidden Castle") Condition: New in shrink. It looks like the box top was shrinkwrapped before the ink dried, so some of the dark ink has bled onto the light background (see photos). This is only on the box top, not the box bottom. Edition: Osprey English Condition: Very good. Includes laminated deduction sheets for advanced game. Comment (added Sun, 31 Mar 2019 03:08:25 +0000): [q="aksosa"]Not to be confused with Alien Artifacts. :whistle:[/q] Quiet you. Condition: Excellent Custom foamcore inserts and includes all of the below: "BattleCON: Devastation of Indines (2013) rank=251 rating=8 " "BattleCON: War of Indines (2010) rank=624 rating=7.78 " "BattleCON: Fate of Indines (2015) rank=1274 rating=8.15 " "BattleCON: Trials of Indines (2016) rank=2970 rating=8.48 " "BattleCON: Devastation of Indines Extended Edition (2013) rating=7.79 " "BattleCON: Strikers (2012) rating=7.46 " "BattleCON: Armory (2015) rating=7.27 " "BattleCON: Light & Shadow (2014) rating=6.98 " "BattleCON: War of Indines Extended Edition (2014) rating=7.84 " "BattleCON: Ernie the Geek Promo (2012) rating=6.9 " "BattleCON: Claus & Wyndhal Promo (2012) rating=6.9 " "BattleCON: Danny the Sinner Promo (2012) rating=6.94 " "BattleCON: Legacy Promo Guest Character (2013) rating=7.42 " "BattleCON: Robert the Saint Promo (2012) rating=6.92 " "BattleCON: Anath Adrasteia Promo (2015) rating=7.76 " "BattleCON: Bruce Lee Promo (2015) rating=8.09 " "BattleCON: Bridj Promo Guest Character (2013) rating=7.25 " "BattleCON: Iris Promo Guest Character (2013) rating=7.5 " "BattleCON: Mark.PTO Promo Guest Character (2013) rating=6.42 " "BattleCON: Iskra Brimstone Promo (2015) rating=7.33 " "BattleCON: Nehtali Promo (2015) rating=7.97 " "BattleCON: Eliza Promo (2015) rating=7.87 " "BattleCON: Prince Elien Promo (2015) rating=7.88 " "BattleCON: Strikers – Promo Pack (2013) rating=7.62 " "BattleCON: Vincent Grey Promo (2015) rating=7.93 " "BattleCON: Lucius Promo (2015) rating=7.62 " "BattleCON: Raederick Blackforge Promo (2015) rating=7.96 " "BattleCON: Takeshi Kamikaze Promo (2015) rating=7.85 "
Condition: Excellent With both expansions: "Dungeons & Dragons: The Fantasy Adventure Board Game – Eternal Winter Expansion Pack (2003) rating=6.78 " "Dungeons & Dragons: The Fantasy Adventure Board Game – Forbidden Forest Expansion Pack (2004) rating=6.81 "
Box slightly worn on some edges. Otherwise very good condition. Sweeteners: "Escape: The Curse of the Temple – Expansion 1: Illusions (2012) rating=7.43 " Box is a little indented in one corner. "Escape: The Curse of the Temple – Expansion 2: Quest (2013) rating=7.68 " "Escape: The Curse of the Temple – Queenie 1: The Pit (2012) rating=7.24 " "Escape: The Curse of the Temple – Queenie 2: Doomed (2012) rating=7.07 "
Some slight shelf wear. Minor indentation on bottom of box. Contents in great shape. Publisher: Eagle Games Year: 2009 Sweetener "Carson City: Gold & Guns (2012) rating=7.7 " New in shrink. Language: German Unplayed. Cards still in shrink. Publisher: WizKids Year: 2011 Some slight shelf wear. Good condition. Sweeteners "Pathfinder Adventure Card Game: Rise of the Runelords – Adventure Deck 2: The Skinsaw Murders (2013) rating=7.64 " "Pathfinder Adventure Card Game: Rise of the Runelords – Adventure Deck 3: The Hook Mountain Massacre (2013) rating=7.68 " "Pathfinder Adventure Card Game: Rise of the Runelords – Character Add-On Deck (2013) rating=7.62 "
Played once. Sweetener "Garden Dice: The Card Expansion (2013) rating=7.12 " Still in shrink. Good condition. Small scratch on cover. Giant River Dragons. Unopened. This is the oversize version of the game River Dragons. Condition: Excellent Includes Broken Token insert and the following expansions (all in the base game box): "Carcassonne: Expansion 1 – Inns & Cathedrals (2002) rating=7.61 " "Carcassonne: Expansion 2 – Traders & Builders (2003) rating=7.6 " "Carcassonne: Expansion 3 – The Princess & The Dragon (2005) rating=6.73 " "Carcassonne: The River (2001) rating=6.97 " "Carcassonne: Expansion 5 – Abbey & Mayor (2007) rating=7.12 " "Carcassonne: King & Scout (2003) rating=6.58 " "Carcassonne: The River II (2005) rating=7.16 " "Carcassonne: The Count of Carcassonne (2004) rating=5.95 " "Carcassonne: The Mini Expansion (2006) rating=7.3 " "Carcassonne: The Phantom (2011) rating=7.55 " "Carcassonne: Cult, Siege and Creativity (2008) rating=6.8 " "Carcassonne: Der Tunnel (2009) rating=6.42 " "Carcassonne: The Plague (2010) rating=6.53 " "Carcassonne: The Flying Machines (2012) rating=6.7 " "Carcassonne: The Gold Mines (2012) rating=6.89 " "Carcassonne: The Ferries (2012) rating=6.79 " "Carcassonne: The Messengers (2012) rating=6.4 " "Carcassonne: Mage & Witch (2012) rating=6.71 " "Carcassonne: The Robbers (2012) rating=6.22 " "Carcassonne: Little Buildings (2012) rating=6.24 "
Box is pretty beat up. Contents in good condition. Condition: Very Good Box has minor wear. Includes: "Lost Cities: Expedition 6 – The Lost Expedition (2016) rating=7.14 "
Condition: Very Good Also includes: "Portable Adventures: Lair of the Rat-King (2003) rank=11770 rating=5.82 "
Condition: Like New Also has "Alhambra: The Falconers (2013) rating=7.17 " in the box. Condition: Excellent Also includes: "Mint Tin Aliens (2014) rank=4788 rating=7.61 " "Mint Tin Mini Apocalypse (2015) rank=4490 rating=7.12 "
Condition: Excellent KS edition, with custom printed level map Also includes the following in the box: "Dungeon Roll: Hero Booster Pack #1 (2013) rating=6.42 " "Dungeon Roll: Winter Heroes Pack (2014) rating=6.07 " "Dungeon Roll Legends: Hero Booster Pack #2 (2014) rating=6.45 " "Dungeon Roll Hero: Guild Leader (2013) rating=6.43 " "Dungeon Roll Hero: Time Traveler (2014) rating=5.98 "
Edition: Rio Grande Games Condition: Very good. One or two pieces punched out of their cardboard frame a little messy. Edition: Spielworxx German/English Condition: Very good. Condition: Very Good, minor crinkling on back cover. Missing one breach token and one casualty token and has extra influence token and extra crown token (money). As I'm the original purchaser of the copy, I'm convinced that's what it came with. Condition: Like New, only a few sheets used. Condition: Components great. Top left front cover of box was significantly dented/crushed in shipping. Can send a pic, if desired. Condition: First edition. Cards like new. Comes in simple paper tuck box that has wear with a printed rules sheet. Condition: Good, but used. Box shows a little wear/tear, one of the box corners is pushed in Played a couple of times, English first edition (2015). Condition: Good, some wear on the box corners Got in previous Hoopla trade, never played. Condition: Like New This is just for the Scenario cards and Plant mini expansion with rules. Note that this does not include the trait cards from this Promo Pack. Condition: Good Opened, but never played. The metal tin has a few dings. Used, complete. Just the base game. Good condition. Opened, Played once, good condition. This is the original edition, with discs and not the animalmeeples. Played and in good condition. Sweetener. "Agricola: Farmers of the Moor (2009) rating=8.09 " Also, original condition so works with the above. Used, fair to good condition. Original edition, not the box shown. Used and in good condition. Excellent condition, played only once. Custom foam core insert is included with this game along with all cards being sleeved. Excellent condition. Opened but never played. Pretty much brand new. Includes the Broken Token insert. Publisher: Flying Frog Language/Edition: English Condition: Unpunched. Unplayed. Miniatures assembled. Out of shrink. Publisher: Grey Fox Language/Edition: English Condition: Board has warping, which is a common/known issue for this game, but game play is unaffected. Played once. Publisher: CMON Condition: Box corners have wear. PM for pictures. Publisher: Asmadi - English Condition: 100% complete. Played a few times from new, in great condition. Only 1 of the campaign sheets used. Publisher: White Wizard - English Condition: 100% complete. Tuck box shows definite wear, but cards in good condition with no glaring issues. Edition: 2012 Condition: Very good, only lightly used. Used. decent condition. If you have never played...interesting, not quite bidding area control game. I have two so can trade one. 2003 edition. Contents in good condition. Box did not come with insert or border for the hexes. 2008 edition. w/Mexico This has the printed chips (not stickers). Box has some dings. 2003 Edition. No Chunnel Box is fair, the cards are in shrink. Used, complete, contains some extra gems. Used, fair condition. Chips have been substituted. Box is fair to poor, contents good. It is missing the "Golden Ticket", not necessary for play. Used, good condition. Sweeteners: "Tri-Ominos (1965) rank=16766 rating=5.28 " Used, fair condition "Troke (1956) rank=12147 rating=6.01 " Used, fair condition This is one of the first games I played as a child...interesting 4 player abstract. "Kensington (1979) rank=16056 rating=5.34 " used, good condition. Bookshelf edition. Used, fair condition. This is a series of Bookshelf games: "Stocks & Bonds (1964) rank=11485 rating=5.61 " Fair condition. "Breakthru (1965) rank=8971 rating=5.79 " Fair condition "Oh-Wah-Ree (1964) rank=9103 rating=5.9 " fair "Facts in Five (1964) rank=4267 rating=6.06 " fair to poor condition. New and in shrink Sweeteners "Stadium Checkers (1952) rank=13268 rating=5.54 " box is poor, some marbles have been replaced. I find this a really interesting game if you have never tried it!! "Fast Trak (1975) rating=6.16 " Good condition, the NHL logo version. "Abalone (1987) rank=1482 rating=6.44 " used, fair condition. good condition. sweeteners: "SET (1988) rank=1289 rating=6.48 " Fair condition "Quiddler (1998) rank=3074 rating=6.03 " Fair condition "Once Upon a Time: The Storytelling Card Game (1993) rank=1392 rating=6.44 " Fair to poor condition, might be missing a few cards. "Liar's Dice (1800) rank=610 rating=6.91 " Fair to good condition. Includes: "Pixel Tactics: Game Caster / Eric Summerer & Army of One / Sam Healey (2015) rating=6.72 " "Pixel Tactics: Game Prodigy / "Lucky" Luke (2015) rating=6.66 " "Pixel Tactics: Sound Guy / Chaz Charlton (2015) rating=6.7 " "Pixel Tactics: Video Guy / Diego Melo (2015) rating=6.66 " Everything new. Comments: Beautiful abstract. Condition: Smoke-free home. New, in-shrink. Edition: Family Games 2013 wooden edition. Sweetener(s): None. Comments: Legacy euro game. Condition: Smoke-free home. New, in-shrink. Edition: English edition (2017) Stonemaier Games Sweetener(s): "Charterstone: Recharge Pack (2017) rating=8.11 (Charterstone recharge pack)" (NIS). Comments: Classic route-building economic game. Condition: Smoke-free home. New, in-shrink. Edition: Multilingual second edition (2008), Queen Games Sweetener(s): None. Comments: Light CYOA book-in-a-game with a great 80s vibe. Condition: Smoke-free home. Used - excellent; played twice; single card missing (came that way out of the shrink) it's an end of chapter story card and did not mess up our playthrough of the game. Edition: English first edition (2018), Language: English, Publisher: Z-Man Games, Inc. Sweetener(s): None. Comments: Great light push-your-luck card game. Condition: Smoke-free home. New, in-shrink. Edition: Mayday games 2016 2nd Edition Sweetener(s): None. Comments: Crazy Launius Ameritrash. Condition: Smoke-free home. Used - very good condition. Edition: First edition (2012), Language: English, Publisher: Eagle-Gryphon Games Sweetener(s): None. Comments: Beer-and-pretzels Ameritrash Condition: Smoke-free home. Used - excellent condition; played once. Edition: English edition (2014), Language: English, Publisher: Fantasy Flight Games Sweetener(s): None. Comments: Classic 3M game. Condition: Smoke-free home. Used - very good condition. Edition: 3M Games English first edition (1971), Language: English Sweetener(s): None. Comments: King-Of-Tokyo-esque fighting game; great painted minis! Condition: Smoke-free home. Used - excellent condition; played twice. Edition: English edition (2017), Language: English, Publisher: CMON Limited/Spaghetti Western Games Sweetener(s): None. Comments: Great minis in an odd fantasy-themed soccer game. Condition: Smoke-free home. New, in-shrink. Edition: First edition (2012), Language: English/French/German/Italian, Publisher: Asmodee/Helvetia Games Sweetener(s): None. Comments: Cool 2P thinky abstract with great chunky components. Condition: Smoke-free home. Used - very good condition. Edition: Gen42 English/French edition 2010 (2010), Language: English/French, Publisher: Gen42 Games Sweetener(s): None. Comments: Charming family-weight, AoC drafting game. Condition: Smoke-free home. Used - excellent condition; played once. Edition: Rio Grande Games First edition (2007) Sweetener(s): None. Comments: Interesting take on multiplayer cribbage (up to 4P). Condition: Smoke-free home. Used - very good condition; box shows some shelf wear. Edition: CoCoCo Royal Edition 2001 (2001), Language: English, Publisher: CoCoCo Sweetener(s): "Wizard (1984) rank=706 rating=6.9 (Wizard - U.S. Games 2011 Edition)"
Comments: Amazingly produced co-op game in VERY large box. Condition: Smoke-free home. New, in-shrink. Edition: English first edition (2016 - wave 2), Riot Games Sweetener(s): Yeah, right :-). Comments: Charming family-weight drafting game. Condition: Smoke-free home. New, in-shrink. Edition: Resonym edition (2016) Sweetener(s): None. Comments: Classic card-driven political game. Condition: Smoke-free home. Used - very good condition. Edition: 3M Games First edition (with double back pictures) (1967) Sweetener(s): None. Comments: Addictive, quick-playing abstract. Condition: Smoke-free home. New, in-shrink. Edition: Z-Man Games English-only edition (2017) Sweetener(s): None. Comments: Great 2P pick-up-and-deliver game. Condition: Smoke-free home. Used - excellent condition. Edition: KOSMOS/Z-Man Games English edition (2010) Sweetener(s): None. Comments: Quick-playing push-your-luck card game from Alexander Pfister. Condition: Smoke-free home. Used - excellent condition. Edition: Pegasus Spiele English/German second edition (2015) Sweetener(s): "Port Royal: Just One More Contract... (2015) rating=7.53 (expansion - Port Royal: Just One More Contract)"; Pegasus Spiele German/English edition (2015); Used - excellent condition. Comments: Great family-weight tile-laying game with the usual solid Days of Wonder production. Condition: Smoke-free home. New, in-shrink. Edition: Days of Wonder English edition (2016) Sweetener(s): None. Comments: Classic Knizia card game. Condition: Smoke-free home. Used - good condition. Box shows definite shelf wear. Edition: Überplay English edition (2004) Sweetener(s): None. Comments: The Daviau Legacy game that started the trend. Condition: Smoke-free home. New. Edition: Hasbro English US edition (2011) Sweetener(s): None. Comments: A really excellent, family-weight small box game that is a great introduction to a time track mechanism and multi-use cards. Condition: Smoke-free home. Used - excellent condition. Edition: Green Couch Games English-only edition (2017) Sweetener(s): None. Comments: Classic mystery-solving game. Condition: Smoke-free home. Used - excellent condition. Edition: Ystari Games English edition 2012 (2012) "Sherlock Holmes Consulting Detective" (not "Sherlock Holmes Consulting Detective: The Thames Murders & Other Cases") Sweetener(s): None. Comments: Classic 3M commodities speculation game. Condition: Smoke-free home. Used - Box shows very light shelf wear. Components look like new. Edition: 3M first bookcase edition (1964) Sweetener(s): None. Comments: Very interesting card-driven 2P abstract. Condition: Smoke-free home. Used - excellent condition. Edition: KOSMOS English edition (2016) Sweetener(s): None. Comments: Classic trading game (with expansion as sweetener!!!!) Condition: Smoke-free home. Used - very good condition; box shows shelf wear, however. Edition: Mayfair Games "The Settlers of Catan" (not "Catan") English fourth edtion (2007) Sweetener(s): "Catan: Seafarers (1997) rating=7.16 " Mayfair Games English second edition (2007); Used - very good condition and also with shelf wear. Comments: Classic Kramer/Kiesling action-point-allowance game. Condition: Smoke-free home. New, in-shrink. Edition: Rio Grande Games multilingual edition (2005) Sweetener(s): None. Comments: Lightweight Friedemann Friese set collection game. Condition: Smoke-free home. Used - excellent condition; played once. Edition: Rio Grande Games English edition (2012) Sweetener(s): None. Comments: Super-fun dexterity flicking game. Condition: Smoke-free home. New, in-shrink. Edition: Brain Games 2017 English/French/Dutch edition. Sweetener(s): None. Comments: Quirky family tracing/racing game. Condition: Smoke-free home. New, in-shrink. Edition: Libellud 2016 English-only edition Sweetener(s): None. Comments: It's King of New York w/ a smidge more complexity. Condition: Smoke-free home. Used - Excellent; played twice. Edition: IELLO 2014 English-only edition. Sweetener(s): "King of New York: Power Up! (2016) rating=7.77 " expansion IELLO 2016 English edition; components included in core game box King of New York Evolution cards from "King of Tokyo/New York: Monster Pack – Cthulhu (2017) rating=7.61 ". ONLY the evolution cards from this one; I'm keeping the King of Tokyo cards and standee for my King of Tokyo game. Comment (added Tue, 02 Apr 2019 14:05:59 +0000): [q="Funky Disco"](It's King of TOKYO w/ a smidge more complexity. )[/q] Lol. Yes...that. Thanks for the catch. Comments: 7 Wonders Duel promo card Condition: Smoke-free home. New. Edition: Repos 2016 first edition. Sweetener(s): None. Edition: Space Cowboys English Condition: Very good. Included paper has been folded. Excellent condition - from a smoke free home. This is out of the packaging (which was discarded), but the cards have never been played. English edition (2001), Language: English, Publisher: Hans im Glück/Rio Grande Games Not sure if the picture is the right cover Game like new, box a little scuffed up from being pushed around a closet. Like New, opened but never played "Adventure Time Card Wars: BMO vs. Lady Rainicorn (2014) rank=5602 rating=6.22 " "Adventure Time Card Wars: Princess Bubblegum vs. Lumpy Space Princess (2014) rank=6969 rating=6.2 "
Played once. Like new otherwise. Played a few times. Great condition, some minis hard to fit on bases but that's how it game new. "Mansions of Madness (2011) rank=296 rating=7.33 " "Mansions of Madness: Second Edition – Suppressed Memories: Figure and Tile Collection (2016) rating=8.19 " "Mansions of Madness: Second Edition – Beyond the Threshold: Expansion (2017) rating=8.36 "
Like new, played twice. "The Lost Expedition: The Lost World Promo Cards (2017) rating=7.26 "
Near Mint Condition. Collectors tin. Publisher:Playroom Year: 2015 Condition: Tabletop edition. Only played a few times. Custom built insert has both regular and pop culture in one box. Still have original Pop Culture box. Sweetener: "Geek Out! Pop Culture Party (2014) rank=6776 rating=6.28 (Pop Culture)" "
This is four the Fantastic Four 2 player starter pack Publisher:Upper Deck Year: 2005 Condition: Minor wear on box. Cards near mint. This is for Spider Man vs. Doc Ock starter deck Publisher:Upper Deck Year: 2005 Condition: Minor wear on box. Cards near mint. Publisher:Matagot Year: 2016 Condition: Mint. Only played twice. Fantasy Flight Games, 2015 Edition Core Set Box Condition: Minor wear on corners, no insert Component Condition: Very good, missing 2 gold tokens and 1 power counter Also includes 2nd core set cards for Baratheons, Greyjoys, Martells, Night's Watch, Starks, Targaryens, and Plot Deck; 2x Daenerys Targaryen alternate art promo; Taking the Black, The Road to Winterfell, and The King's Peace expansions. Publisher: Kosmos Language/Edition: English edition (1999) Condition: Used, in good shape. Played twice, light wear on cards, good condition. good condition, all money wrapped. Edition: 2015 Condition: Very good. This is the original game and cards. Does not include the additional cards from Timeline Events/Classic/Inventions etc. Those cards fit very easily in this box. Includes: "Retreat to Darkmoor: Legendary Expansion (2016) rating=7.66 " Both New. 1st edition. NIS. Currently OOP. Components in excellent condition. Box cover (and rulebook corner to a lesser extent) has some surface water damage as shown in pictures below. For what it's worth, the inside of the box lid is perfectly fine. looks like a fork lift went through the box. nothing else is damaged. home made foam core insert. "Eminent Domain: Escalation (2014) rating=7.8 " escalation expansion included in the core box. Used, very good condition. Includes Lost Legion expansion, all in base game box. New in shrink. Includes the following, all of which are also new in shrink: "Sentinels of the Multiverse: 5th Anniversary Foil Villain Collection (2016) rating=8.43 " "Sentinels of the Multiverse: Void Guard (2018) rating=8.23 " "Sentinels of the Multiverse: Stuntman Hero Character (2018) rating=8.24 " "Sentinels of the Multiverse: Benchmark Hero Character (2018) rating=8.14 "
Mayfair Expansion #9 Hot Tin Roof, Patrician AND "Mayfair Games' Limited Edition Promo Expansion Set #10 (2014) rating=6 " Mayfair Expansion #10 Whitewater Bedpans & Broomsticks AND Mayfair Expansions Villainy Lords of Vegas All, New and in Shrink. Mayfair Expansion #19 Aeroplanes Extra Extra New and in Shrink. AND "Mayfair Games' Limited Edition Promo Expansion Set #15 (2015) rating=6.96 " Mayfair Expansion #15 Steam Asgard's Chosen Opened, Unpunched. Mayfair Expansion #4 Road Rally USA Elk Fest Ablaze AND "Mayfair Games' Limited Edition Promo Expansion Set #10 (2014) rating=6 " Mayfair Promo Expansion #10 Bedpans & Broom sticks Whitewater Both New and in Shrink. Adios Amigos New and in Shrink Red discount sticker on box. Maya Madness Opened, in very good condition. Condition: Like new, played once. Multilingual Edition. Game condition: Very good. Box condition: Good. There are some corner creases and a little corner wear. Condition: Very Good Sweetener: "The Castles of Burgundy: Drawstring Tile Bags rank=31 rating=8.3 " These drawstring bags are not the same as on the geek store but they were made from a 3rd party, and serve the same function. Can provide pictures at request. Game condition: Very good. Box condition: Minor wear. Very good. One of the of the back page of the rulebook folded over a little at the tip. It also contains the deluxe promo pack (new in shrink) and the three additional war dice. "Rumis" Game condition: Very good. Almost like new. Box condition: Good. The box has moderate wear. New. In a little baggie. Game condition: Very good. Includes the "BANG! High Noon (2003) rating=6.71 " expansion in the box. Box condition: Very good. Light edge wear. But wait, there's more... "BANG! 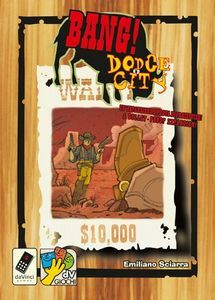 Dodge City (2004) rating=6.87 " - in its own box, also in very good condition. Like new. Played once. Most components still unpunched. Like new. Pictured edition. Plastic version. Components still unpunched and in shrink. Like new. 2 player game. Great condition. Box has retail(?) sticker/label along the one of the sides of the box cover - but not the cover itself. Includes: "Folklore: The Affliction – Huntress Promo Card (2018) rating=8.12 " "Folklore: The Affliction – Shield-Maiden Promo Card (2018) rating=8.12 " "Folklore: The Affliction – Soothsayer Promo Card (2018) rating=8.12 " All are new. Like New condition. Played twice. English second edition (2014) Like New Condition. Played Twice. Box shows wear. Components are Like New condition. Like New Condition. Stickers unused. Sweeteners: "Dragonfire: Adventures – Sea of Swords (2018) rating=8.16 " "Dragonfire: Adventures – Chaos in the Trollclaws (2017) rating=7.79 " "Dragonfire: Adventures – Shadows Over Dragonspear Castle (2017) rating=7.53 "
Signature Edition (2002) Like New condition except coins. The gold paint on the coins has started to flake off. After cleaning one under running water and drying with a paper towel it looks like a shiny silver coin with patches of gold. Like New Condition. All pieces are professionally painted. Includes custom foam inserts. Like New Condition. Played Twice. Sweeteners: "Legendary: A Marvel Deck Building Game – Noir (2017) rating=8.01 ": Like New, No Box. "Legendary: A Marvel Deck Building Game – Guardians of the Galaxy (2014) rating=8.02 ": Like New, No Box. Acquired Used. Very Good Condition. Includes DVG component tray. Acquired Used. Played twice. Very Good condition. Sweeteners: "Machi Koro: Millionaire's Row (2014) rating=6.78 ": Like New, No Box. "Machi Koro: Harbor (2012) rating=7.1 ": Like New, No Box. Acquired used, but never played by me. Very Good Condition. Punched and bagged. Miniatures are still in sealed bag. Condition: Good Box is worn, components very good. Description from the person I got it from: "This copy has been played 10+ times. Has significant shelf wear on corners and was dropped one time by me with one split corner. That being said, the game is complete and has a lot of plays left in it." English edition (2007) Like New Condition. Condition: Excellent KS edition Includes the following: "Chaos & Alchemy: Apprentices (2014) rating=6.42 (Chaos & Alchemy: Apprentices)" "Chaos & Alchemy: Magnum Opus Kickstarter Promo Card (2014) rating=6.07 " "Chaos & Alchemy: Substances (2013) rating=6.41 "